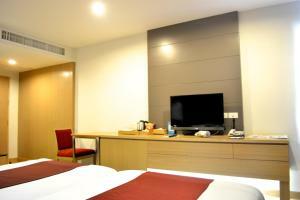 Located in Bangkok, A-One Motel offers comfortable rooms with air conditioning. Boasting an outdoor pool, it has a fitness centre as well. Free Wi-Fi is available in public areas. Featuring on-site parking, A-One Motel is 6.3 km from Patpong nightlife area and 9.8 km from Khao San Road. Suvarnabhumi Airport is 19 km away. 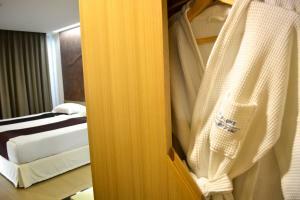 Comfortable rooms are provided with a flat-screen cable TV, a refrigerator and a minibar. 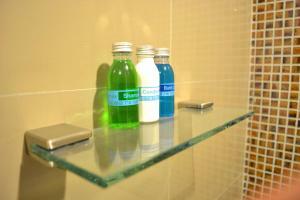 Featuring shower facilities, an en suite bathroom also comes with free toiletries. For convenience, the residence offers a 24-hour front desk and luggage storage facilities. Other services available include shuttle, laundry and ironing. Open for all-day dining, the on-site restaurant serves international dishes. 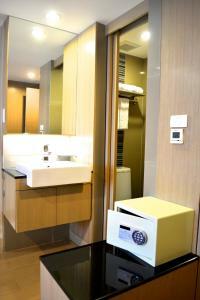 Air-conditioned room features a flat-screen cable TV, a fridge and a minibar. 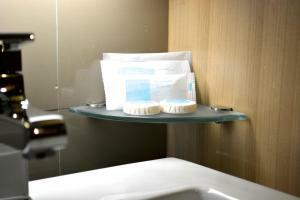 An en suite bathroom comes with free toiletries. Rate: THB 1232.50 ... THB 1479.00; select dates below to get current rates.